Preparing for Christmas Pt. 1—Rent Early! It’s coming. In less than 24 days in fact. Depending on your church, you are anywhere from 1-3 weeks out from one of the busiest weeks of your year. And had I been really thinking this through, I would have written this series before I went on vacation last week. But I didn’t, so here we are. I want to let you in on my Christmas Season preparation. Having done this a few years (read 20+), I’ve made a lot of mistakes and learned a few things along the way. Over the next few days, we’ll focus on different aspects of preparation, and hopefully we’re still far enough out to help. If not, we can both plan better next year, OK? I learned this lesson almost 15 years ago. I was living in Ohio and was the volunteer audio director. 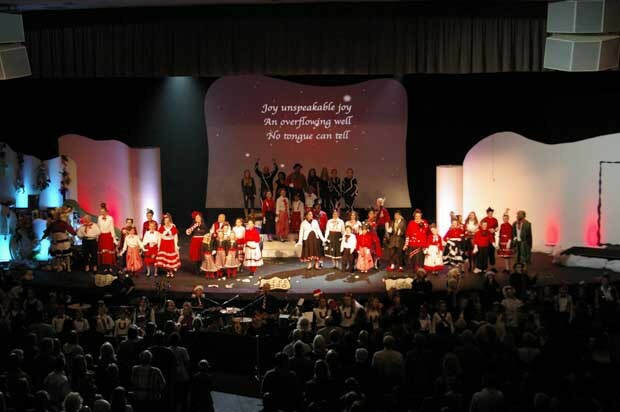 It was my first time through their Christmas season, and it was the first week in December that I learned we would need about a dozen channels of wireless—complete with headset mic’s—to handle the two weeks worth of production (yes, we had a children’s musical followed by an adult musical the next weekend; we changed that the following year…). One of the biggest challenges to doing Christmas in church is that many churches don’t start really planning their Christmas production until, oh, December 2nd. Sometimes you can pull that out, but more often than not, you’re in trouble. I finally found two places that would rent me some mic's (and one of them pulled new ones off the shelf and charged me a fortune to rent them). But the next year, I started asking about Christmas in September. I figured we wouldn’t get answers until October, but at least we were further out. The last few years, I’ve had my my rental contracts signed and done by mid-November. Even out here in LA, if one waits, one can expect to pay a lot more. The first year I was here, we decided to try something pretty ambitious and we waited a little long to lock things down. That meant we ended up renting things from way up in LA, which meant expensive delivery fees. If you’re reading this in early December, and you haven’t booked whatever rental stuff you need, get on it. This week. Hopefully you can still find what you need. Of course, it always helps to have a relationship with a rental company, even if you only rent from them one or two times a year. We don’t rent nearly as much as we used to what with budget cuts and all, but we still have good relationships with a few rental houses, depending on what we need. Occasionally, Christmas is a great excuse to pick up that extra channel of wireless or three you’ve been needing, or perhaps some new headset mic’s, or even light fixtures. Every year, I put money in the budget for Christmas and Easter, and depending on what we’re doing, I decide if I rent or buy. Do the math and place the order. Just don’t wait. This can also be a great opportunity to try out some equipment you’re on the fence about buying. A new, larger audio or lighting console, mic’s, even lighting fixtures are great things to try out with a Christmas rental before you commit to purchase. Just be sure you get them early enough to become familiar with their operation before show day. So that’s the first step; book your rentals. Next time, we’ll talk about other preparations to make.